On June 19, 1910, the very first Father’s Day was celebrated in the United States. We continue every year, on the third Sunday of June, to take a special day to observe and honor all the wonderful father figures in our lives — from real fathers and stepfathers to uncles and grandfathers. With Father’s Day just around the corner, what do you plan on giving that special father figure in your life to show your love and appreciation? If you’re a scrapbooker, why not make a Father’s Day scrapbook page?! It’s a simple, yet heartwarming way to honor all the little things that make him so special to you. Theme — A theme for your Father’s Day scrapbook page will set the tone and dictate the colors and styles of things you add to the page. Some ideas for themes are: your father’s favorite hobbies, his occupation, or just something simple like “Dad and Me.” You could also do themes about special events, celebrations, or just memories. 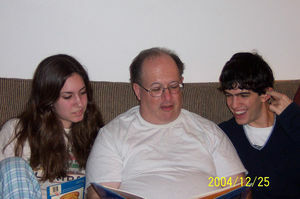 Page Title — Centering your page around a fun phrase can be a creative way to show your father how much he means to you. Some examples of Father’s Day scrapbook page titles are: “Daddy’s Little Girls” or “Man of the Hour”. Here are some more Father’s Day phrases to use for your scrapbook page. Layout — The layout you choose will determine how you organize all the things you plan to put on your Father’s Day scrapbook page — including photos, phrases, titles, memorabilia, and journaling. Here are some good examples of Father’s Day scrapbook page layouts, plus some digital scrapbook page layouts for Father’s Day as well. Quotes & Poems — Including quotes and poems on your Father’s Day scrapbook page is a classy way to add a special touch. Here are some examples of Father’s Day quotes and Father’s Day poems. Photos — A Father’s Day scrapbook page would not be complete without photos of your dad. Not only will a photo serve as a reminder of your love, but if you include photos of you and your dad together, you will both be able to relive those times you spent together. Special Memories — The heart of your Father’s Day scrapbook page lies in the special memories and unique moments you decide to share on the page. Be sure to include some very personal info about your dad — like his talents, skills, achievements, and personality traits that make him the father he is today. I’m currently a graduate student. I like volunteering with a variety of organizations in my community, spending time with my nieces, and sharing fun tips about health & beauty issues.